If you want to be free from your fear of flying quickly and easily, if you want to feel calm and comfortable when flying again, then you need the Overcome Fear of Flying program. Because it's a complete professional solution in an advanced audio program which contains powerful, clinically-proven techniques which are fast and gentle and produce permanent results without the scare tactics used by the older and less effective treatments. The Overcome Fear of Flying program has been created by top phobia specialists [more ] who you can talk to [ ] because we run real clinics [ ] where we get real results. With your copy of Overcome Fear of Flying you will have access to techniques that are normally only available to clients in our private clinics where we help people like you to overcome your phobia almost every day. So If you are reading this and think this is what you have been looking for, try it 100% risk free today - download the Overcome Fear of Flying program and start noticing the benefits right away. The Overcome Fear of Flying program is a direct professional treatment program for you to download today and listen to in the privacy and comfort of your home. It comes in the form of two cutting-edge audio tracks mp3s - Flying Phobia Cure and Pure Calm – which have been clinically tested to work on fear of flying. The mp3's have been optimised for easy downloading. All you need to do is buy the Program, download it, listen to it and expect to notice changes straight away. That's it. Quick, comfortable, permanent and safe. No drugs. No scare tactics. 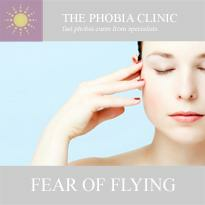 Visit our website www.phobiaclinic.net [ ] to learn all about the fear of flying, how it affects people, who it affects, how it starts and how it is cured [ ] and about the Fast Phobia Cure technique [more ]. We maintain very high standards in our clinics and this is reflected in our Overcome Fear of Flying program. But it's not perfect and we believe that it will not be effective for approximately 10% of people. For those 10% we offer a no-questions-asked 30-day 100% money-back guarantee.